A.M.T. makes all the difference. SLIKs exclusive A.M.T. super Aluminum-Magnesium-Titanium alloy legs make the PRO 500 DX tripod rock steady, yet lighter than it looks. The A.M.T. alloy has a 40% greater strength to weight ratio than standard aluminum, making it lighter and stronger than the standard metal used in most tripods. The PRO 500 DX is capable of supporting the weight of Professional Digital cameras and heavy telephoto lenses up to a 300mm f/2.8. 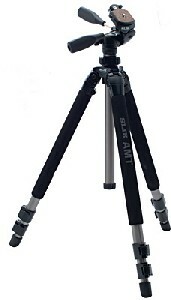 This complete tripod offers advanced amateurs and student photographers the strength and stability they need, while its size and the use of A.M.T. alloy make it lighter and more portable than many professional offerings from other manufacturers. A tripod should be solid and easy to use, so you spend more time concentrating on your photography than you do your equipment. The PRO 500 DX makes setting up easy with secure, speed-release leg locks (pictured left). A gearless center column and 3-position, adjustable angle leg locks allow easy set-up on uneven ground or steps. The adjustable angle locks combined with the PRO 500 DX Short Column (optional accessory) allow the tripod to be lowered to just 15 inches for very low angle or macro photography in the field. Stable all-metal PRO 500 DX 3-Way Head with easy-to-use quick release. The included PRO 500 DX all-metal 3-way pan head has over a solid pound of finely cast and machined aluminum. It uses a fast and easy to use quick-release plate to securely mount the camera on the tripod. Or, would you rather use a SLIK professional ball head? No problem. The PRO 500 DX head can be removed and the tripod legs have a standard 1/4-20 thread that can also accept a thread adapter to 3/8 in. Between these 2 sizes, the PRO 500 DX can mount almost any tripod head on the market today. The sturdy legs can handle up to 10 lbs of equipment with ease.